I signed up for Elise Blaha’s Get Crafty workshop, which started on Monday. Along the same lines as my kickstart photo project, I’m hoping this workshop will get me thinking in a crafty frame of mind again. I finished my first project last night, and I’m so happy with it… not just because I like how it turned out, but because it was fun to put it together: cutting, gluing, stamping, all of that jazz. I’ll admit to being pretty skeptical about the whole scrapbooking phenomenon, but the workshop is sort of scrapbooking outside the box, and I can get behind that for sure. It’s more collage and papercrafts and photography all together, which is right up my alley. Plus! It was an excuse to buy things at the craft store and Staples, things that would normally count as “unnecessary” like a date stamp (!!!) and markers and cardstock and labels and shipping tags and new scissors. 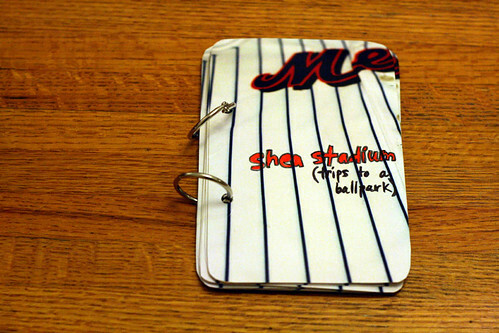 The book itself is a collection of photos and memories of my seven trips to Shea. (The full sets of photos are over on flickr.) 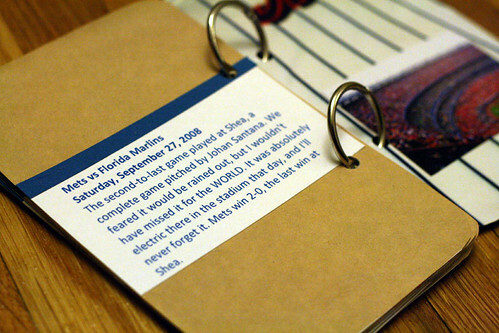 I printed one photo from each game wallet-sized, and wrote little bits about what I remember most about each game (or rainout, as the case may be). This is especially cathartic as the Mets begin their season at CitiField, which promises to be gorgeous, but is still in need of some memory-building. 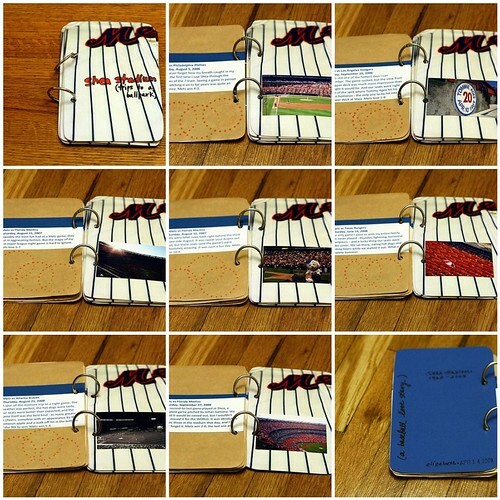 This entry was posted in baseball fan, crafts, papercrafts, photography. Bookmark the permalink. I really like how your book turned out ! This craft does sound perfect for the Secretary of the Nerd Club! 😀 The book looks great, and it’s such a fun way to keep your memories of Shea!